Born in 1941 and raised on a working-class family, she starts her carreer as an actrice. Her first appearance was in 1963 Jean-Luc Godard's film "Les Carabiniers" where she met Patrice Moullet (acting the principal role). 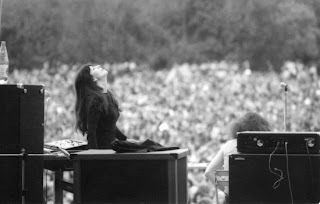 It was in 1967 that Moullet, then interested in music, proposed to compose music for her poetry. 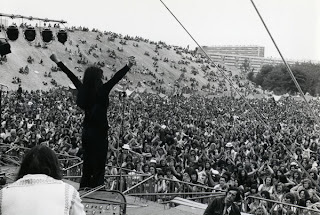 They formed the band 2 BIS (soon to be renamed ALPES) and proved the ideal vehicle for Ribeiro's extraordinary voice, on the seven classic albums they produced together. 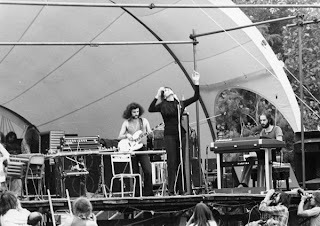 Ahead of a conventional rock format, their music was a unique amalgam of progressive underground, with vast spacey instrumental passages due to Moullet's home-made instruments (percuphone, cosmophone & orgolia), much improvised weirdness and a strong folk influence. "Le temps de l' autre" is the last RIBEIRO + ALPES album, a very cohesive progressive rock affair with more keyboards and percussion than their previous ones. But it is this out-of-character voice, emerging of emotional inferno, tender and affective, wild and revolutionary, painful and ecstatic, vast as a universal mother yet ravaging everything on its way to personal catharsis. An excellent album full of surprises, showcasing ALPES as one of the most unique french progressive bands. Hooray! I didn't have this one. Thank you very much for this and for all the other Catherine posts! I became a big devoted fan of hers. She's really unique! I also love her solo works - 'Blues de Piaf' and others in which she perfectly combines chanson tradition with her uncompromising rebellious May 68' spirit. Amazing as usual Spyros..... thanks. Say any chance of any Laurent Vanay other than Galaxies and Evening Colours....?? she best ever!!! no one in world ever post "no. 2". you have? thanks a lot, it's a great one. from her official site, it's not her last with the Alpes. she had two more, in 1979 and 1980, "Passions" and "Le Deboussole". 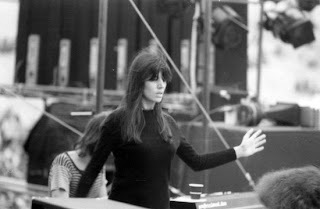 Thanks a lot for following sharing all these treasures of Catherine Ribeiro, she's a amazing composer and singer, an inspiration. And thanks too for the blog, even if I listen some things, I like to learn about all these artist. Amazing... just like every other Ribeiro album that's been posted on this site. It's cool how on the last song they start rockin' like Magma. Thanks a lot for posting this. But is this really the last Alpes album? I've seen two later Alpes albums listed - Passions, from '79, and la Deboussole from '80. Are these two any good? I don't think this lp has been reissued since:great find,thanks! thanks a lot, she's incredible. great record! 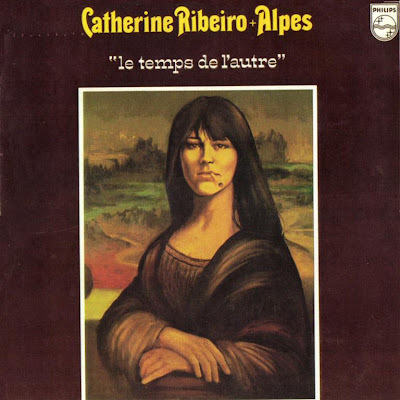 thanx for the catherine ribeiro post! one request: if there's possible to post the new age - all around from 1967, pat kilroy seems to be part of this band for this year before he decease. "no one in world ever post "no. 2". you have?" nevermind. of course you have posted it already!! WHERE HAVE I BEEN FOR THE PAST 40 YEARS?! I had not heard (of) her until today, when WMFU played "Poeme epique" and distracted me from my work. I say "her," but of course the musicians of Alpes are just as unique-sounding, as is the overall sound as a group. They defiantly flouted the conventions of their epoch. NO DRUM KIT, thanks. No bass, thanks again. Sometimes their music sounds like that of ancient Greece. In this woman's voice, I hear a trajectory between Leo Ferre and Catherine Ringer. THANKS IMMENSELY FOR ALL THE C.R.+ALPES POSTS! I barely peak any French, but the sound of her voice alone moved me. Thank you so much for sharing this. Do you know any Catherine records recorded in Portugal? 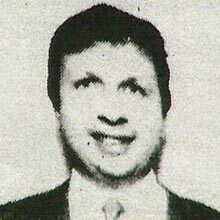 I missed this album when posted two years ago, only now have I realised that there was a missing Alpes album I'd not heard. Many thanks Mutant Sounds team, for your continued excellence in sharing little known gems.